So, in our search intense, search driven world of how consumers seek out solutions and connect with brands that are able to provide resolution to their needs, how do you be there? How do your build an effective SEO (Search Engine Optimization) program for your brands and products? (See here for the Basics of Search – Understanding SEO and SEM in 2016). Having said that, here are six simple steps you can take to "be there" when someone is looking for something that your brand or product can deliver on. Today, it's absolutely essential for a brand to be there on social media. Consumers and customers want to be empowered by brands to be connected and be in the know. Ans social media is where they turn to for that connection and brand engagement. A website is no longer enough, and on your website you must include social sharing buttons and ensure that web content is always shared on social platforms that you are on. Social media interaction is key – you really cannot engage and interact on your website with your audience as you can on social. Make this your key channel and be relevant. Improve your social media engagement. Move from Selling to building Relationships – this is what will end up giving you a far more robust presence online. Start with getting your mobile marketing strategy right (see how here). With the proliferation of smartphones, our world is in a whole new age where mobile is absolutely key. Ensure that your mobile experience for your audience is seamless and geared towards in the moment decision making that will lead them to the action you desire. A large majority of your target audience uses mobile to access search and as well, your brand website and blogs and your social. Ensure that your presence online is mobile-first – meaning have easy to use navigation, and content that loads effectively and quickly on mobile devices like smartphones and tablets. YouTube is the world's second most popular search engine. After Google. Your brand really needs to be there when people are looking for solutions to their needs – and are particularly looking for video content. Encourage User Generated Content on video about your products – count on unboxings, reviews, how-to's and as well populate your online presence with commercials, video posts, and brand videos in general. Your target audience is more likely to click on search results that include a video. Society is becoming more visual and less stimulated by written words. And, Google gives preference to video results on their Result Pages. Here's how to create compelling video ads and content. The world of video marketing is expanding every day. Earlier in April 2016, Facebook announced several new features that involve new technologies in video. And, just a couple of weeks ago, Google and YouTube unleashed the power of 360-degree Live Streaming on their platform. Every single social platform is focusing on video. Instagram have expanded their video limit to 60 seconds to enable brands to better engage their audiences with video content. Video is a great way to be there in today's search crazy world. Grab the reader or viewer of your video with a short interesting header. Every bit of your content should also have proper meta descriptions which gives the reader a specific idea of what your content is about. Your meta tags and descriptions need to be unique and quickly explain to the viewer why they should read or view what you are saying. Start with keyword analytics. You need to listen to what's being said and build on that. Start with listening, and make this an on going source of what makes up your strategy. Ensure that your owned media content (your website, your blogpost) has all the right keywords that your target consumers would associate with your brand, your product, your vertical, your competitors, your industry. Keep this approach fresh, and constantly evolving, or else your brand or product will simply slide down the results pages. Use hashtags to determine what's being said around your product. Use them in your twitter presence and instagram posts. Be on top of how search engines change their parameters – particularly Google. Use some of their suggested tactics. But get the simple stuff done first. As listed above. That's the basics. That's Digital Marketing 101. Thanks. Nice post. It's probably useful today to have a SEO specialist or an agency to help. All points mentioned need a SEO focus. 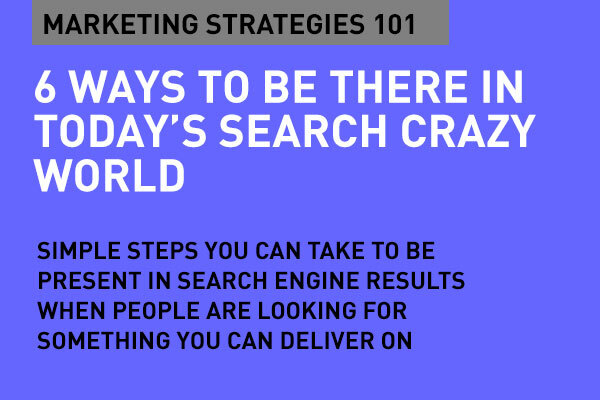 As Google has been stressing, the importance of being there in search results is a very important task for today's marketers. Brands do rely on paid search a lot, but the importance of building content on the right channels is critical, and SEO is the key to that secret. This article is about the relevance of content and SEO in content, and it really highlights the important boxes one can tick in that respect. I have seen a lot of websites and content that ignore the power of the meta tags – specially the key words and the description. Yes, the header is important, but so is the meta.